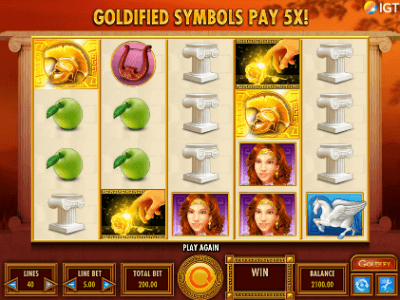 Goldify slot will surprise you with its interesting features. As a plot of the game, the developer, IGT Slots, took an instructive legend about the Greek King Midas, who turned everything that he touched into gold. Now the players get to know the hero of myths and try to turn things into coins. To achieve this, manufacturers supplied the application with special symbols, bonuses, and tempting options. Now Goldify is very popular in Canada due to its availability of Canadian residents. The slot machine is a successful illustration of the well-known myth of the ancient Greek cycle about the greed of King Midas, who asked God Dionysus to give him the ability to turn all objects into gold. The story that ends very badly for its protagonist teaches people of moderation and also recalls that one must be cautious about own desires. Well, Midas, unequivocally, became a victim of his own greed and insatiability, but his mistakes can be well learned. Speaking the language of the modern gambling world, it is always worthwhile to stop both in case of losing a large sum and in case of luck: only those who seek the golden middle can discover a true victory. 40 paylines present in Goldify can be used at your own discretion. Functionality is also excellent and will please the players with unexpected solutions. So, the unique function of Goldify allows you to select one of the basic symbols before the beginning of gambling and conditionally make it gold. Thus, the casino will pay in five times for all subsequent winning combinations with this sign. The players will not find a risky round here. But spectacular revolving with exciting actions can bring tangible cash rewards. For improving your playing skills, you should first try this game without risks and investments, with no money from an endless demo. However, even if you decide to immediately play in earnest, you will not regret: a 5-reel slot machine with 40 pay lines, special symbols system, free spins, and a payout percentage of up to 96.20% will be the best option for those who do not want to spin their backs idle.